Let me take this opportune moment to welcome you to the most fertile land in India, agriculturally, spiritually, entrepreneurially and ultimately academically which houses the relatively fast moving management paradise called “Narayan Academy of Managerial Excellence” known for embedding in itself, a growth engine suited to the global business dynamism of the contemporary world. 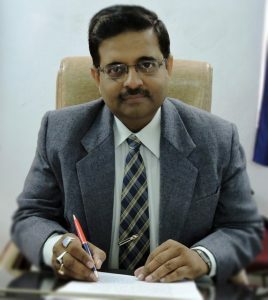 As an integral part of the Gopal Narayan Singh University, this institution, also popular as Faculty of Management Studies (FMS) unfolds the spirit of excellence through meaningful pursuit of objectives encompassing the resource-opportunity interface in this once industrially flourishing township of Dehri-on-Sone and historic place Sasaram. The newly established University through its societal values embodiment under the supportive arms of the Deo Mangal Memorial Trust presents a redeemable parlance to the minds getting invested for an unparalleled output that is expected to drive-in changes for the betterment of the society. NAME (FMS) finds privilege in becoming such a beacon. From this historic place, we once again welcome you to witness the robust foundation destined to become an icon for modern managerial thoughts and practices directed towards deliverables that would have meaningful impact on the society.